This attractive easy to assemble salad can be prepared up to 4 hours ahead of time and refrigerated until ready to serve. 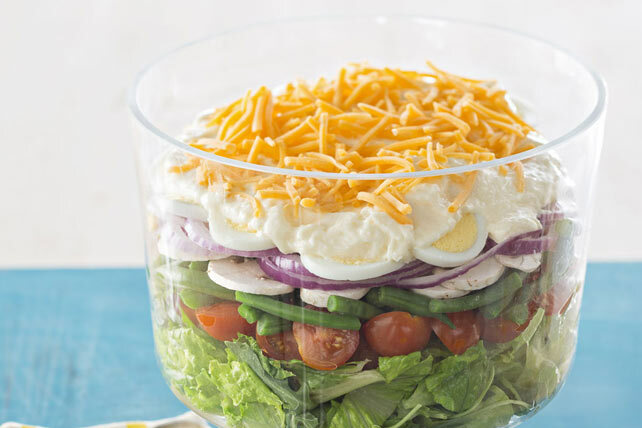 Combine salad greens in large bowl; top with layers of vegetables and eggs. Mix Miracle Whip and Parmesan until blended; spread over eggs, completely covering salad. Sprinkle with cheddar. *Made with a blend of oils including olive, canola, and soybean oil. For best layering, reserve half of the combined salad greens; place remaining greens in bowl. Cover with layers of remaining ingredients as directed, starting at side of bowl and filling in center of each layer with some of the reserved greens. Add cut trimmed beans to saucepan of boiling water; cook 3 min. Drain beans, then immediately place in bowl of ice-cold water to stop the cooking process; drain.